What is a parterre, you ask? In all honesty, before discovering the two currently on display at the Atlanta Botanical Garden, I had never heard the word parterre. 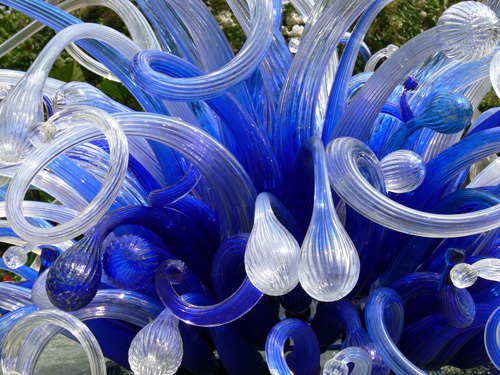 If the Fuqua Conservatory or Canopy Walk aren't quite enough the tip the scales of decision toward visiting the Garden, then maybe the Dale Chihuly-created parterres will. While I love the Nepenthes Chandelier hanging in the atrium of the Hardin Visitor Center (Its bright greenness is actually the wallpaper on my laptop), the Levy Parterre (photo) nestled between the Rose Garden and the Alston Overlook is just as remarkable. Starting on February 5, 2011, the 2011 annual "Orchid Daze" will feature thousands of blooms coupled with an array of water features in an exhibition titled "Liquid Landscapes." Or if you're looking for a romantic idea for Valentines Day, consider "Valentines in the Garden: Romance Blooms!" on Saturday, February 12, 2011.